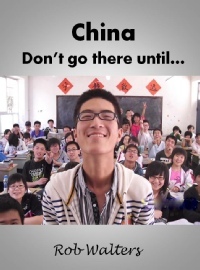 If you are thinking of going to China to teach or to travel then do not go until you have read this book. Essential reading. The army of people who regularly descend on China to teach its youngsters English has a multitude of motives. One cutting website that has been reporting on the plight of foreign teachers for some years divides the army into three groups which could be labelled: young, old and in the middle. The young are graduates who travel to China for the experience of teaching in this strange country before beginning their careers. The old are doing the same at the end of theirs and the middle group are those who are escaping failure in their home countries. Yes, it’s harsh, but like all crude categorisations it contains grains of truth. So what were we? Well, old, I suppose - though it is never that simple. My wife retrained as a foreign language teacher fairly late in life and gained some experience in Oxford teaching some of the kids that flock to my city to learn ‘Oxford English’, something that does not exist but is one hell of a brand. We went east to attend a pig killing. Our son lived in Taiwan and had recently had his own son and the poor pig had to die to celebrate the birth (he’s married to a Taiwanese aboriginal lady). Whilst we were there my wife found a teaching job on the mainland in a city that we had never heard of: Yan’an. The agency asked her if I could teach too since the school required two teachers and I said yes (thus destroying all hopes of a four-month writing holiday as a kept man). And so we were committed. We signed contracts, agreed a laughable salary and received a start date for our induction course in May of 2007. The experience was... well, mind stretching. The country is so big, the people so diverse and the intimate task of teaching vast classrooms of teenagers and actually living in a school was an insight that that you cannot buy. And a little, just a little, like the man who liked a product so much that he bought the company – we went back four years later. The dice seemed to be loaded since we landed jobs in exactly the same province, yet this second experience was very different. On this visit we were not awestruck by the vastness of China and the shocked reaction of people to our presence. This time we could be more reflective: we could observe and compare. We were not green and we did know a little, not a lot, but a little, of the Chinese psyche. And so in February of 2011 we arrived once again at the city of Xi’an and began the journey to our new school. What follows is an edited log of the notes that I wrote during those two visits. It is certainly not meant to be a textbook on how to teach English in China – far from it – and it does include many recollections of travel and leisure in addition to those on teaching. However, as a textbook it does contain some useful tips and some cautionary experiences. It probably will not discourage anyone from undertaking a similar experience, though it may make anyone considering the adventure a little wary. Note that I have changed the names of some of the people that we met on our two trips, for reasons that will become evident. I would not have missed these two sojourns in China for anything. The memories live on, fresh and clear in many cases.